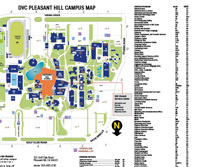 Tutoring at Diablo Valley College is available free of charge to all DVC students who seek help or are referred by an instructor. Tutoring instructional assistance in various academic subjects is provided by trained peer tutors and by instructional assistants. Our goal is to ensure that students enrolled at Diablo Valley College receive the academic support they need to succeed in their classes. See EOPS for individual schedule and tutoring request form. Geology Tutoring PS 110 See lab for schedule. See lab for drop-in, group tutoring, and individual tutoring schedule. See MESA coordinator for tutoring and SI schedule. Evenings after 5, 24-7 Saturdays and Sundays; Q and A and paper-drop off at all times. See Puente coordinator for tutoring schedule. See schedule for specific study group session times. See UMOJA Coordinator for tutoring and study group schedule. See Student Veterans Resource Center for hours and services.